Leave from Indore by Train at 9:10 pm. Overnight in Train. Arrive in Jaipur & you will be transferred to your hotel & check inn. Evening you will be taken to Chokhi Dani where you can enjoy a traditional Rajasthani Meal(on own). Overnight at the hotel. Depart for Mandawa by surface approx. 151 kms/ 4hrs. On arrival check in at your hotel. Afternoon visit the Havelis of Mandawa. Evening will be at your leisure. Overnight at the hotel. Morning depart for Bikaner by surface approx. 210 kms/ 5hrs. Late afternoon arrive in Bikaner & check into the hotel. Afternoon depart for local sightseeing of Jinagadh Fort. Camel Breeding Farm & Deshnok Temple. Evening will be at your leisure. Overnight at the hotel. 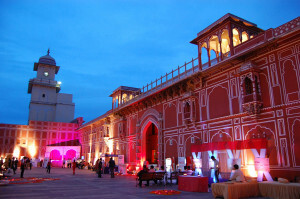 Evening will be at your leisure of free for shopping for local handicrafts in the market of Bikaner. Overnight at the hotel. Morning you will depart for Khimsar by Surface approx. 145 kms/ 4hrs. On arrival you will check in at your hotel. Evening will be at your leisure. Overnight at the hotel. Morning you depart for Osian by surface approx. 60 kms/ 2hrs. On arrival you will visit the temples of Osian. Afternoon you will depart for Jaisalmer by surface approx. 220kms/ 5hrs. On arrival in Jaisalmer you will check in at you hotel. Evening will be at your leisure. Overnight at the hotel. Morning you will proceed for a half day sight seeing tour if Jaisamler visiting Gandisar Lake, Jaisalmer Fort and Patwon Ki Haveli. Late afternoon you will proceed to Sam village to witness the spectacular sunset on the Thar Desert. You can also enjoy a camel ride on the sand dunes (on own). Evening you will return to your hotel. Overnight at the hotel. Morning you will depart for Jodhpur by surface(approx. 285 kms/ 5hrs). Evening you will return to your hotel. Overnight at the hotel. On arrival in Jodhpur you will check in at your. Afternoon depart for local sightseeing of Jodhpur visiting, Mehrangarh fort, Jaswant Thada & Umaid Bhawan Palace. Evening will be at your leisure or free for shopping in the market of Jodhpur. Overnight at the hotel. Morning Leave for Jaipur Via Ajmer. Reach Jaipur in Afternoon. Shopping in Jaipur. Train for Indore at 10:00 Pm. Overnight in Train.